I took the time today to process all my photos from yesterday and ended up culling two hundred and sixty photographs down to eleven. In fact, shooting Thursday and Saturday I snapped over seven hundred shots and only have 36 to show for it (and that number may go down still). It is hard for me to do, as I am inclined to keep everything. That said, I am getting a lot better at it. All I want to keep are good, interesting photos. My increasing inventory of 'nice' shots has had the biggest impact on my ability to get rid of bad shots. Now that I have more than a handful of shots that make me go "wow", I can better tell what it takes. Which brings me to the point of todays post. I more than doubled the amount of photos that are on my Flickr account. You can find them by following this link. Now the pictures that aren't of Clyde actually outnumber the pictures of him. 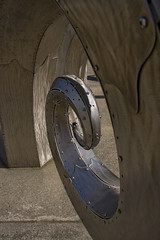 Salmon Waves, a sculpture by Paul Sorey, at the Hiram Chittenden Locks. BTW, net-luddites, did you know that you can subscribe to my flickr stream in with a reader such as Google Reader. You didn't? Get with the program!!! For example, I have blog I like that posts twice a month if that. If I were to go to their site everyday hoping for some new content I would get irritated quickly. Not so with a reader! Since it is my one stop shop for everything from political goings on, Formula 1 news, Seahawk info, automobile news, to pictures of my sisters pug, there is always something new to read daily.